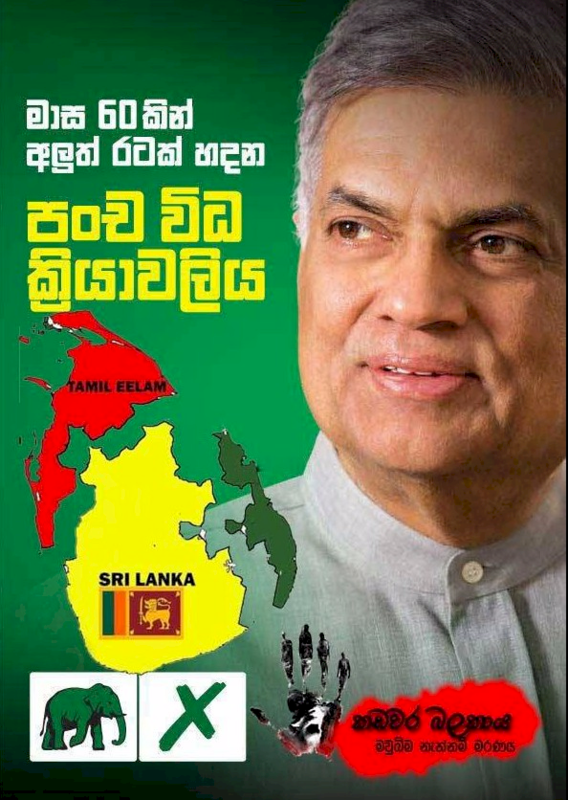 Imperialism one world policy coated Ranil Wickremasinghe (RW), somehow planned his strategy, to siphon out a Russian trained HE Maithripala Sirisena, into his clan of imperialist congregations to capture power with the help of Tamil Separatist voters on the 8th of January 2015, under false agenda. This is an indication, beyond doubt, of power hunger, as the ideologies of the two gentlemen is totally contrasting. RW was appointed Prime Minister from a minority party membership in parliament, which is undemocratic. Citizens of SriLanka should be astute to ask a question from RW, on the volume of developments that RW carried out or completed during his past political career. Well, the fact is that he has not completed any development/ projects that will accrue adequate return to the country or has a positive Net Present Value (NPV). The only project the imperialistic leader did was to finally sign a Cease Fire Agreement (CFA) with the LTTE, under the direction of Norway, allowing LTTE, access to the Colombo ports to deal and wheel heavy weapons into Vanni, and bring weapon advisers under the sentimental name, NGO”. The leader, RW, took the country to risk of national security and threat to sovereignty of SL by drafting an agreement called, Interim Self Governing Authority” (ISGA) for the LTTE. It was fortunate that the document was not signed. If LTTE and GOSL did sign the document then it was a clear path for LTTE to declare an independent state of Tamil Eelam with foreign troops flooding the country to take over possibly Trincomalee”. The above acts were carried out by RW when Chandrika Bandaranaike (CB) was the Executive President. To classify, the president and the PM were in opposite camps, however, did CB question, and explain to the people of SL why such an agreement was signed, and such a frightful agreement, ISGA was prepared? Does it not illuminate that CB was incompetent in her position as an executive President? Can we hide facts and truths for long? When late Srimavo Bandaranaike came to power in 1970, she made people to realise that they have to grow more food for their consumption. She made people to realise the value of Kahata”. What a contrast between the mother and the daughter. RW’s and the UNP’s did not develop the country or kept abreast of technological advancement. If the citizens would do a root cause analysis on the problems, they will arrive at the wrongdoers are the imperialistic cohorts under the Senanayaka, Jayawardhane, and Wickremasinghe era. Since 2005, the country was subject to eradication of terrorism, rehabilitation of LTTE terrorists, investments, and development. Since 2005 to January 8th 2015, citizens could observe that SriLanka had completed development in infrastructures, investments, technology, communication, academic institution, medical facilities, research and scientific affairs. Colombo city, which was dirty was cleaned up and developed under the Mahinda Rajapaksa (MR) regime. The Hambantota port and airport was ridiculed as white elephants by wags and pranksters with lack of perception and intelligence, however, it is an investment that gears to positive NPV on a long term. People and politicians who have shortfall in strategic vision may not understand the value of investments. They could enhance their knowledge to understand development policies. Both the investments are foreign exchange earning investments. Only strategic initiative framework planners can engage in such planning, and act, which is what MR government did. The Tamil issues were almost extinguished by conducting elections to the Northern Provincial Council (NPC). However, power greed Tamil Diaspora who are the left overs of the Ramanathan/Arunachalam were not contended, but want their own power. It is the Tamil Diaspora elites who forcefully brain washed the Tamil politicians to fight for more power. The dollars and pounds dictate terms to the TNA. The Banda–Chelva pact was an agreement signed between the PM and the leader of the ethnic party Chelva on the 26th July 1957. In September 1957, Jayawardena announced a 72 mile march from Colombo to Kandy in opposition to the pact. Although the proposed march was banned by the government, the ban was ignored by the UNP. The very same imperialistic tyrant leader, Jayawardhane signed the 13th amendment on the 29th July 1987, known as the Indo-SriLanka accord with the Indian PM Rajiv Ghandi, which avowed the devolution of powers to the provinces. If we go back to history, Tamils were, and, are demanding for devolution of powers with an objective of achieving a separate state for the elites in a few years. To whom are they demanding the devolution of power? It is only a few aristocratic elites, who are drenched with power avidity to control the Tamil mass, are demanding devolution of power. Devolution of power will definitely not help the Tamils for various reasons. Who are the people who are in politics now? It is the very same aristocratic elites and those offspring are rotating among the Tamil political party. 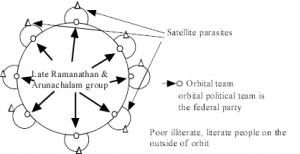 To give a clear picture the following diagram indicates the people in power. 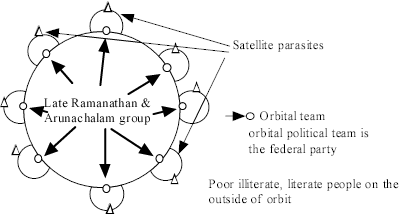 The orbital team is full of the clandestine Ramanathan, Arunachalam offspring, and the satellite parasites are the second generation offspring of these clandestine aristocrats. Those elites will never allow any outsiders to come into politics. The clandestine elite is constituted with Diaspora, in the ring of power gang. The country belongs to the people who are citizens of SL and not the politicians. Politicians are elected representatives to administer on behalf of the people. People own the country, not the elite politicians. A few politicians claim of their rapport to older royalty. One must think that the kings and queens did not work and earn to buy a land, but killed people and seized the land by force. It’s another form of pillaging. Politicians must understand that they do not own the land that they govern. Democracy was introduced to eliminate monarchy, and govern through elected people’s representatives. However, in the third world, particularly in SriLanka, the monarchy cousins have surfaced with their wealth to capture power. What is RW’ goal? Divide the country to please the west? Will he recoup his left over projects in 2002 such as the bridge to India, give more federal powers to the North and the subsequent division? Can the country afford to run such a depressing administration? Where will RW accrue his funds to operate a federal administration? Does the North accrue revenue to operate a federal administration? It is the Sinhalese people’s hard work will sacrifice to fund such federal administration. Where is RW’s thoughts focussed? Has he become an entertainer to the west, when we already know that he is an imperialism coated politician? This is what will be the outcome in six years. August 17/2015 is a crucial, definitive, Election Day, when SriLankan must focus and give their serious thoughts and analysis on RW’s past and present cunningness & unpatriotic acts, and cast their vote to MR’s team, and remove RW and UNP from politics. One Nation, One Country, is Mahinda Rajapaksa and his team. People should vote for MR and his team to keep the country in tact as one country, one nation. 1.5 million Tamils in the N&E, against 20 million people in SriLanka does not need a separate governance. The proletariat and the low caste Tamils in the N&E should think and understand whether the federal administration is for them, or for the Ramanathan/Arunachalam elites only. Thank you. Good to see that at least one Tamil has to guts to speak the truth. Kanthar P Balanathan, Mara (Great) Thamilan !!! The elite Tamils of Sri Lanka have always grown up, especially since the colonial times, with a ‘bourgeoisie’ mentality. This was because many of them had the opportunity of having ‘English education’, and thus have had the opportunity to control the high positions in the government administrative machines and professional bodies in a disproportionate manner. In fact they used to walk with air of rulers in those days. So, it was inevitable for them to have an air of inborn superiority complex over the other communities. But over the time, after the colonial rule, people from other communities also got educated, now with the ease of being educated in their vernacular language, and soon caught up with the ‘elites’ in terms of employment and high positions and other places, snatching away the or dwindling the chances of the ‘elites’. Therefore they had to find a way, or to devise a plan so that they could be back in a position to dominate the common mass as they used to before. Otherwise they would not have opposed the so vehemently the ‘Standardization of education’ in favour of the rural students, irrespective of the race and religion, very well knowing at the same time that it would also benefit the Tamil students in the backward areas. (One should keep it in mind that there is a ‘quota’ system in exists in India to provide education and employment opportunities for the ‘Dalits’ and backward caste people for the sake of bridging the disparity among the different communities there) Ironically, they used the same that would have benefited the Tamil students in the rural areas, against the government and destroy the future of the those students as it were the student population from the rural areas who took up arms in large numbers and died without knowing the real cause while the children of the elites and cities fled to foreign countries. Of course there were many young men and women from rural areas also later on found their way to foreign countries, but I found them to have a sense of gratitude towards the militant groups (and the ethnic war situation) that it was because of the fights in Sri Lanka that they were able to go and settle in foreign countries! Now they have been helping to fund the election campaign of the Tamil elites with the money they earned by toiling from foreign soils. I wonder as to when will the truth dawn on these people, and they will wake up to act wisely? Mr Kanthar – you are a gem of a patriot. It is with people like you that Sri Lanka will have a future. We lost many opportunities in the past because of the tribal politics. It is time all Sri Lankans join together to move forward as one nation. At the present time this is only possible under a Mahinda Rajapakse administration – this is crystal clear for an administration with Ranil of the Red Lipped Brigade can only bring disaster to the entire nation and a perpetual war with undefined borders – Eelam and various “is tans” of the Jihadists. I sincerely hope that the people of Sri Lanka are not that unfortunate. The PREPONDERANT BULK of the EVIDENCE of UNPATRIOTIC ACTS to DATE by most Sri Lankan Tamil people, and their incurably COMMUNAL leaders makes me UNWILLING to TRUST their COMMON SENSE and GOODWILL. However, Kanthar Balanathan’s writing kindles a spark of hope in my breast, that the HUMANITY we share may yet TRANSCEND our communal differences to bridge the yawning gap in TRUST between our two peoples! That hope SPRINGS ETERNAL in my human breast! TRUST is what has been broken. Tamil leaders must hold themselves responsible for that. How can Federalism ever work in Lanka when the Caste System still exists for some 15 Million Tamils of Dalit origin living just 12 miles across the Palk Sts in Tamil Nadu. They desire to leave Tamil Nadu for better and fresh pastures, further from Tamil Nadu the better. Federalism for Tamil folk means death for the rest of Lanka. The Vaddukoddai Resolution of 1976 is still not revoked officially. I do not see why Lanka should be held responsible for problems of Tamil Nadu. Some 86 Tamils have already returned to Lanka from the TN camps. It is said that there are some 100,000 Tamils listed as ‘refugees’ from Lanka in TN. Where is Lanka going to put this never ending stream of Tamils from Tamil Nadu ? Lanka does NOT need Tamil LABOR. There is enough population in Lanka for Labor purposes and Tea estates can use machines for tea plucking. Hela Tamils (Kumar’s words) must assimilate into mainstream Lanka, get educated, healthy and happy, and take pride to be citizens of Lanka, stop fighting/boxing with shadows from Tamil Nadu, and be loyal to the country Lanka that nurtures them. Ananda-USA and Fran Diaz. The Tamil trust was never broken by the Tamils for MR it was: This disgraceful JVP killer the election commissioner who did the ballot staffing and RANIL PUNK to do what he is doing now. I am sad to say that the Tamil Leaders have let down Sri Lanka after Independence (1948). Tamil Leaders have always misled the Tamil people re Separatism and Violence. The Tamil people always follow the Tamil Leaders re Separatism and even Violence. No Tamil Leader has put forward the notion to remove the V’koddai Resolution (from decades ago in 1976) – for Separatism through Violence. That is how things are to date ! Tamil Leaders go with the west and Tamil Nadu leaders, right or wrong or how many die for nothing. Dishonor, cheat & deceit follow the politics of today. Even earlier good politicos (who may be past due date now !) are forced to tell ugly, blatant lies under the nasty guidance of Tamil leaders and the UNP etc.